Beaded Rivolis are quite fascinating. For a long time, I have been wanted to have a go at them. 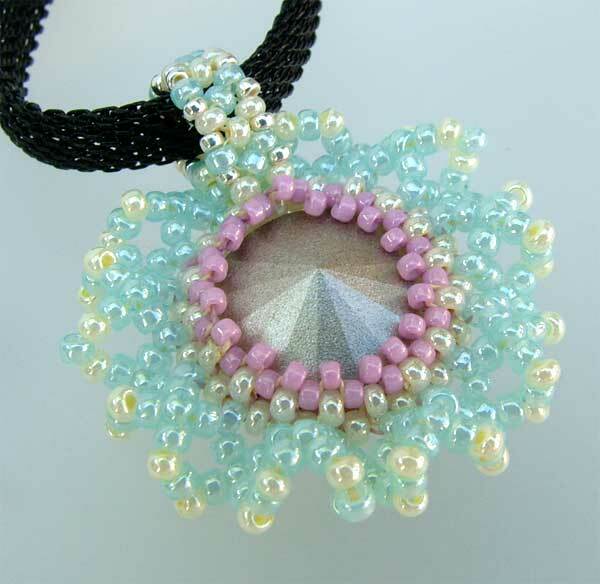 I have done a few of these beaded rivolis now and they can be found throughout my Design Gallery page. But here, I have decided to compile any new beaded rivolis I made here for convenience. This was one of my earlier trials at beading a bezel for a rivoli. I have just found the photos I took then so am posting them now a whole 6 months++ later! This pair was given to my sister over the 2011 Xmas break. Until I started with beading round a rivoli, I must confess that I never really knew what to do with them. 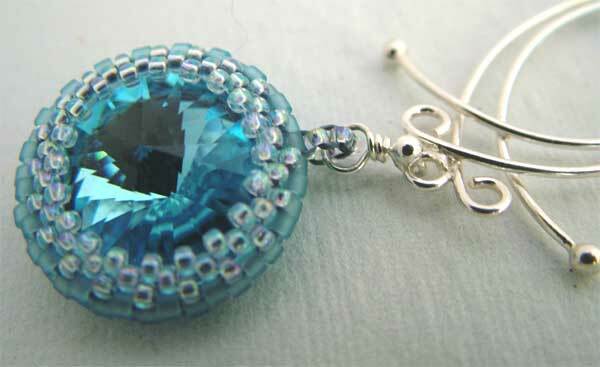 Now I have discovered how deeply mesmerizing, how rich, and super sparkly are the rivoli stones from Swarovski. 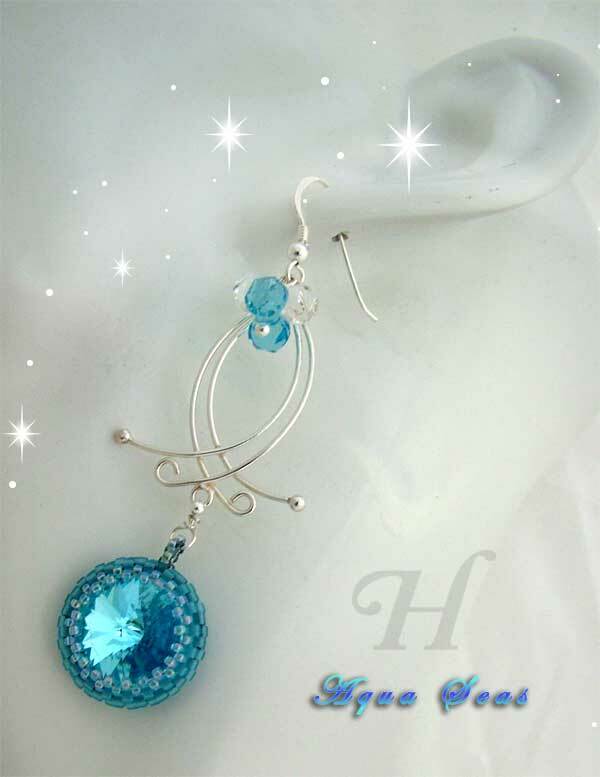 This particular one is Swarovski Rivoli in Aquamarine. Photo above showing front and back of the beaded rivoli. This is a foiled stone to increase the reflection and sparkle of the stone. Almost all of the Swarovski rivoli stones are provided with their quality foiling. The loop or bail of this rivoli stone is made with one row of ladder stitch. 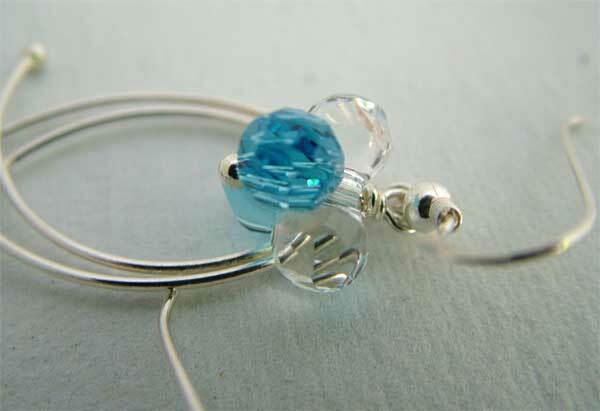 I have made the metal connector (which connects to the earring finding) in Sterling Silver wire (0.5mm gauge) with a seamless Sterling Silver round bead at the top. 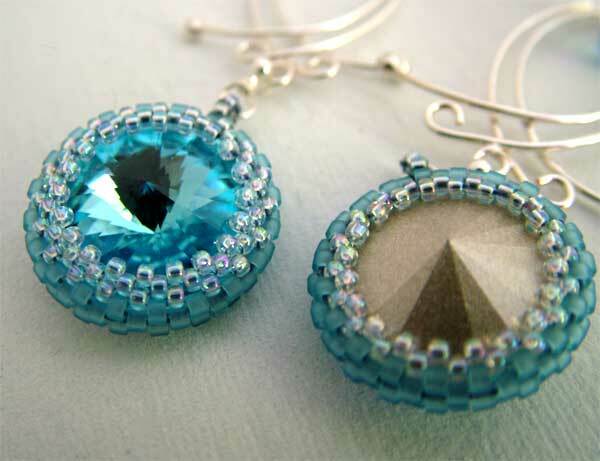 The top beads are made from the under-valued but intriguing Swarovski Modular Beads. 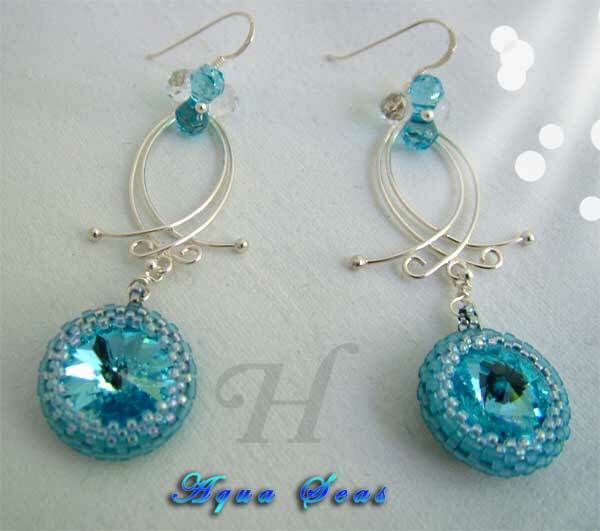 Here there are 2 of them: in Crystal and in Aquamarine stones. This rivoli pendant was created a while ago so I may not remember all the work and material details. The rivoli here used was a Swarovski #1122 Amethyst. The back of the beaded rivoli stone. 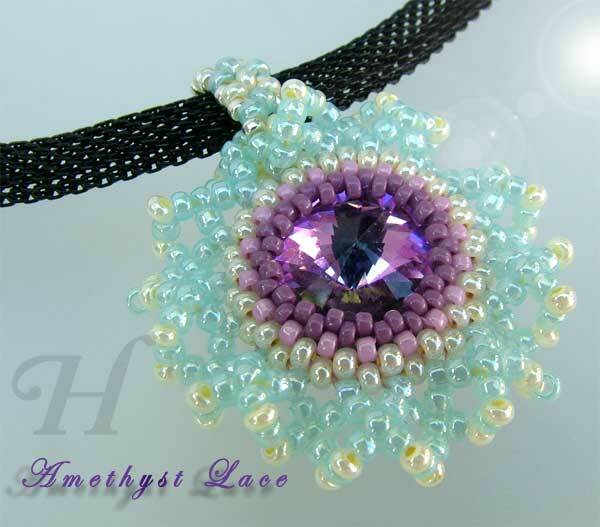 You can see that the Swarovski Amethyst rivoli is foiled for extra brilliance. The bail is made in one piece and joined to the beaded rivoli (not the netted part). The bail is done in RAW (Right Angle Weave) and smaller beads (size 15, Sterling Silver plated seed beads) are used to fill the "gaps" in the RAW stitch. In this instance, the bail was large enough to go onto a black mesh-chain (copper chain) necklace as per customer request. However if, at the time of making the bail, you are going to use a chain that has a large clasp area, you might want to make the bail around the chain itself if it won't fit over either end of the clasp.